Ledaire Fabrications Ltd - specialist producer of high quality, tailor-made stainless steel and aluminium extract canopies and hoods for commercial and public sector kitchens. Established in 1925, Ledaire Fabrications Ltd. is a specialist producer of high-quality, tailor-made stainless steel extract canopies and hoods for commercial and public sector kitchens. All Ledaire products are manufactured to HVCA Kitchen Ventilation Systems Standard DW172 in accordance with the Health and Safety Executive Catering Sheet No. 10 ‘Ventilation of kitchens in Catering Establishments’. Experienced design engineers are available to advise on all aspects of modern kitchen ventilation from the initial concept to the satisfactory commissioning on completion. The selection of suitable ventilation equipment can be dealt with to ensure that you, the customer, have the ideal - installation work of the highest quality, at the lowest price. 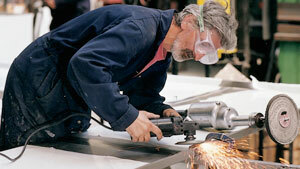 Ledaire Fabrications Ltd. has an experienced team of precision sheet metal workers at the company’s factory in Croydon.